Plant of the month. June 2016 OH, THE PAINTED DAISIES! – Glacier View Landscape and Design, Inc.
Plant of the month. June 2016 OH, THE PAINTED DAISIES! The heat of June has begun and one of the favorites of the garden has started to bloom. 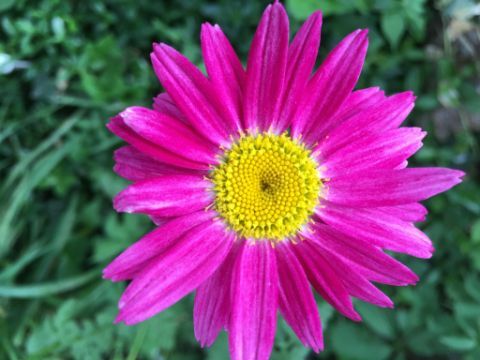 Painted Daisies (Tanacetum x coccineum) are just stunning this time of year with their deep, rich pink, crimson, or even mixed hybrid colors. The fern like stem and foliage adds to the texture and beauty of this perennial garden favorite. Painted Daisies are known for repelling insects because they contain trace amounts of pyrethrum, a commonly used natural insecticide made from the dried flower heads, and are also deer resistant and attract butterflies! They can also bloom all summer long if dead headed properly and regularly. They thrive in full sun to partial shade or very bright indirect light under a high canopy shade tree such as mature maple. The one shown in the pictures grows next to Hosta and Periwinkle in what should be a shade garden! It prefers well drained sandy soil and is rather drought tolerant once established. It does not like heavy clay soils, but needs adequate drainage instead. There are several varieties available that range from 18″-30″ tall. They look great if planted en masse and can easily be found available as flats of 4” pots or smaller to ease the pocketbook! 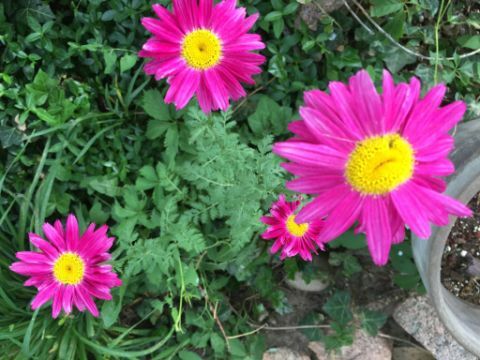 The Painted Daisy is really an old-fashioned perennial and has been used in Boulder Colorado landscapes for over 100 years. It is classified as an Old World perennial native to Caucasus between the Black and Caspian seas, and is closely related to Chrysanthemums (mums). Plant a grouping in a sunny, well drained area of your perennial gardens and see the richness of colors come out when they bloom!